“The soil of India is my highest heaven. The good of India is my good” Swami Vivekananda after his wandering all over India came to Kanyakumari and sat in meditation on 25 , 26 and 27 December 1892. To spread these message of Swami Vivekananda amongst the public , to focus on cultural tradition, this Samartha Bharatha Parva is being conducted by all Vivekandanda Kendra Vidyalaya Schools. This year we have selected the rural area Thiruvenkadanathapuram (sirumazhanchi) near vallioor. Fifty Students who were given enough practice and ten teachers went there. 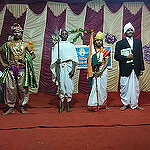 The programme was started at 6.30 p.m. Village panchayat leaders Mr.Thangasamy Nadar and Mr. Dhavasikani Nadar were the special guests. Nearly 325 people were the audience. Our Principal Mrs. R.Andal welcomed the gathering and the programme were commenced by prayer song and Bharathanatyam . Various cultural programme like Debate , Patriotic dance, Folk dance, National leader’s play @ conversation about Swami Vivekananda were impressed by the audience. Finally Mr. Ooikattan, Rtd Postman proposed the vote of thanks. Mr.Jeyarai who was the members of panchayat gave away the award on behalf of Sirumazhanchi people. The programme was concluded by Kendra Prayer. Our correspondent Mr.S.K.Subramanian arranged the function in a successful way.